Obituary – Colbert, Jennie Ellen (Warner) « Perry High School Alumni Association, Inc.
Glee Club, Girls Reserve, Blue Curtain Dramatic Club, Honorary Society, Scopics Club. Graveside rites for Jennie Ellen Colbert, 87, Perry, are set for 2 p.m. Saturday at Grace Hill cemetery. Rev. Cortez Cranfill will officiate. Arrangements will be under direction of Brown Funeral home. The family will receive visitors from 7-8 p.m. Friday at the funeral home. Mrs. Colbert, daughter of William “Bill” and Edith Warner, was born Oct. 3, 1909 on the Warner homestead, five miles east of Perry. 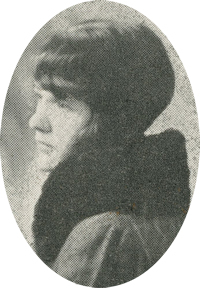 She attended Pioneer district 40 rural school through eighth grade and was a 1927 graduate of Perry high school. She also attended Draughn’s Business College in Oklahoma City. She was employed by Western Union and worked in the “new” Biltmore Hotel in Oklahoma City before transferring to Dallas, TX. She married Earl D. Colbert of Dallas. Colbert was transferred to St. Louis, MO where Mrs.
Colbert worked 17 years as secretary to the vice president of Anheuser-Busch, Inc.
moved to Perry to make her home with her sister and brother-in-law, Mabel and Frank Eby. Mrs. Colbert was a member of the First Christian church of Perry and Christian Women’s Fellowship. She was preceded in death by her parents, two brothers, one sister and one grand niece. In addition to Mr. and Mrs. Eby, survivors include nieces and their spouses, Evelyn Hill, Bartlesville, Laural and Gene Zavodny, Tulsa, Joy Eby, Eveleth, MN, and Ann and Charlie Scott, Perry; nephews and their spouses, Jay and Marilyn Eby, Prescott, AZ, Bill and Gloria Eby, Rogers, AR, and Jim Ed and Margaret Eby, Muskogee; and 13 grand nieces and grand nephews.